Wild geraniums are my Friday photo. This morning I am feeling as though I’m “done” with flower photos for the short term and plan to look for other woodland things that catch my eye this weekend. On Roundtop I’ve pretty much photo’d all the regular spring wildflowers found the mountain. Summer brings a different set of blooms, but even with the heat that’s predicted for this weekend, it will be too soon for them for a while. Wild geraniums are a favorite of mine. That shade of pale purple or lavendar is striking and unusual. For a wildflower the blooms are large and gaudy. 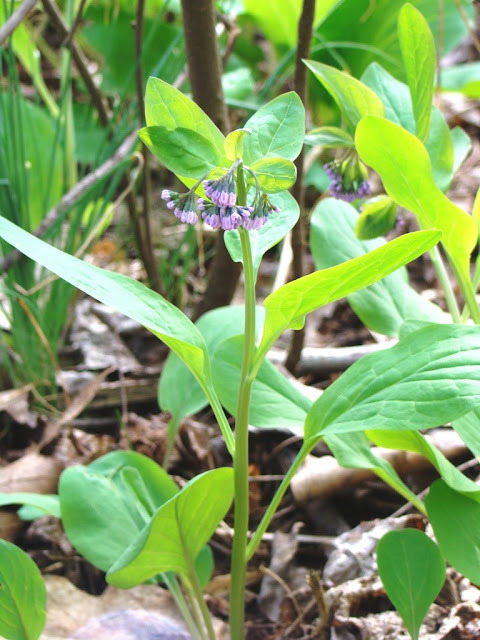 The plant is usually 8-10 or so inches tall and the blooms are close to an inch across. Each plant has several blooms, which only makes them stand out even more. This year the number of geraniums is fairly normal, which is something of a letdown after last year when they ran riot across the forest floor. 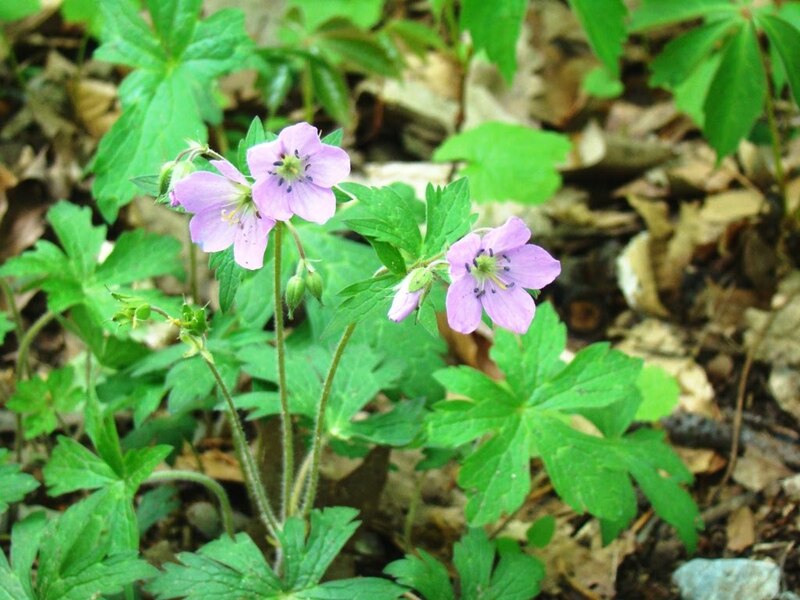 The wild geranium has several common names—wood geranium is one I like—but I’ve never heard it called that around here and “here” is where I live, so I’m sticking with wild geranium. The plant is happy in both dry and moist woods. 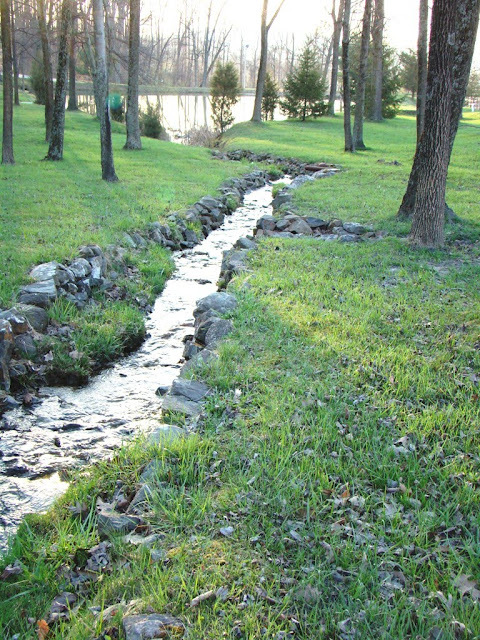 Roundtop falls into the generally dry category, at least most of the time. Apparently the blooms can sometimes be white or nearly so, too. That’s another version I’ve never found here. I don’t think I’d like the white version as much as the purple ones. Part of the reason I like the flower is for the color of it. …so they don’t know it’s not May just yet. Actually, the mayapples have been blooming for a few days already. I just hadn’t gotten around to getting a photo of them before last evening. 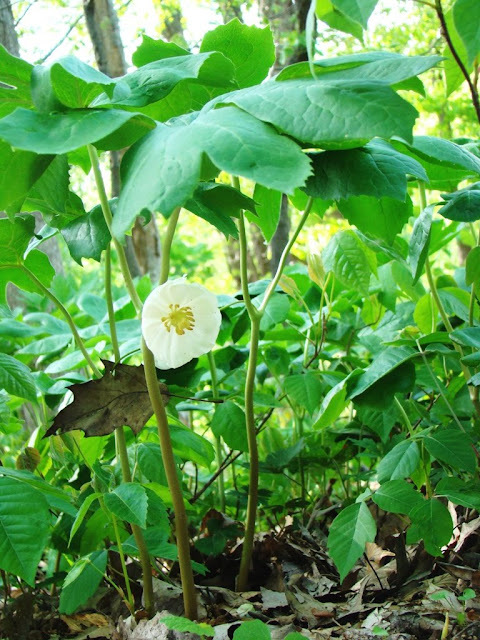 As you can probably tell from the photo, the umbrella part of the mayapple plant pretty much hides the bloom, so to see the bloom crouching or laying on the ground is needed. The other thing that’s typical about mayapples that you can also tell from this photo is that they thrive where poison ivy is happy. Mayapples line my driveway, so I can crouch there to avoid the poison ivy. I’d like to make the poison ivy disappear, but I haven’t figured out how to do that without also getting rid of the mayapples, so I just let it all alone. The mountain was frosty or close to it again this morning, but the forecasters promise this morning was the end of that. I won’t mind finally turning the heat off, but mostly I’m looking forward to getting the summer plants outside and leaving them there. It’s not just that they need the sun—the cats tend to nibble on them, and I can’t put the plants anyplace high enough to keep those two away. Frosty is the word that pretty much sums up the morning on Roundtop Mountain. Last night was cold enough for snow but as nothing fell from the sky, it didn’t. The past few weeks I‘ve spent a lot of time hauling summer plants in and out the front door of the cabin. The plants are sun-deprived if I keep them inside, but the nights are too cold for them. So they are trundled in and out on most days. This morning was even too cold to put them outside for the day, but they can stand a lack of sun for one day. I am starting to lose track of how much and how quickly the weather is changing this year. Winter was cold and snowy; March was warm, even hot; April was dry and mostly cold. The mountain has gotten some relief lately from the dry weather, but the cold persists. This year the redbud have been pretty nice, the dogwood not so much. I don’t know if the dogwood are suffering from the fungus I keep hearing about or if they don’t like this season’s odd weather. 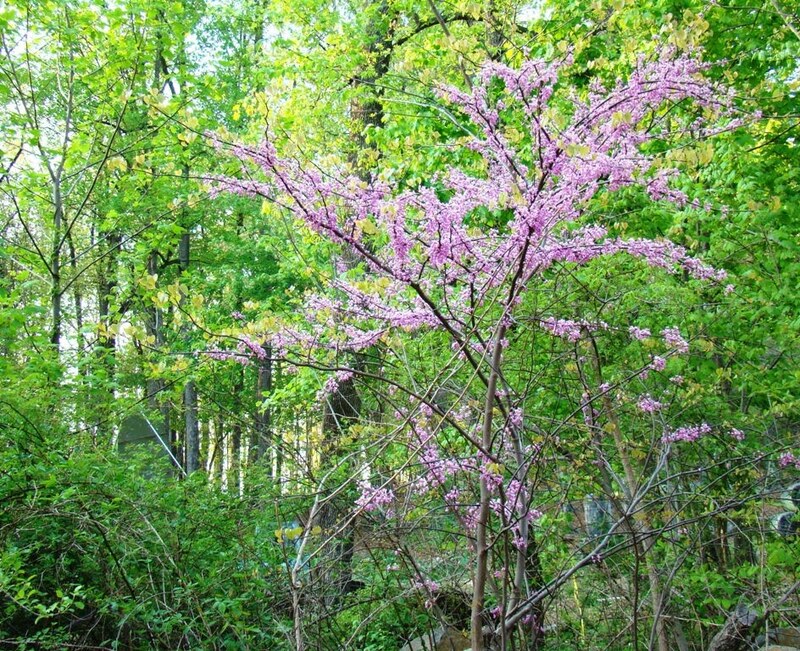 The quality and quantity of both redbud and dogwood vary from year to year anyway, so it can be hard to tell. One year the redbud is prettiest, the next it’s the dogwood. In a really good year both redbud and dogwood are lush and budding at the same time. That doesn’t happen all that often, but when it does the result is worth the wait. What scares me a little about the dogwood fungus, named anthracnose, is that it’s supposed to thrive in rainy, cool spring weather. The cool part has been much in abundance this April. I’m hoping the limited rainfall this spring helps to keep that away from here. The fungus is hardest on trees that are stressed, and as far as I can tell, the native dogwood around the cabin are healthy—but I keep checking the leaves whenever I see one of the trees. This morning the rain stopped, the sky cleared, and Baby Dog and I took our usual early-morning jaunt around the mountain. Even the biggest, brightest emerald in the world has nothing on the bright green and lush foliage of the forest this morning. A dripping, dewy woods in spring is one of the prettiest things on this earth. Baby Dog and I ventured a bit further than usual since we weren’t dodging raindrops and mud puddles. We passed one of the snowmaking ponds. 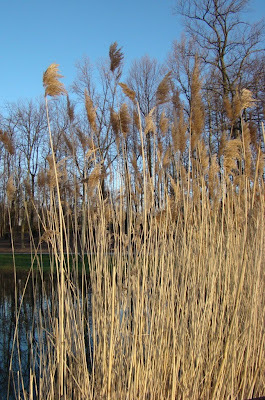 Sawgrass covers one end of the pond, with the new green shoots climbing up through last year’s dead brown ones. 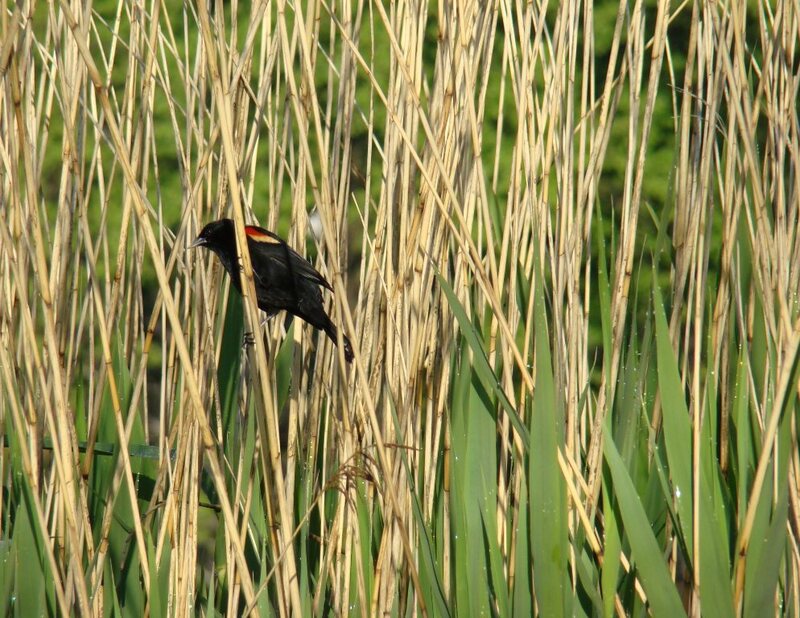 I heard a familiar sound—the red-winged blackbird. The blackbirds nest inside the stand of sawgrass, building their nest near the water line. I’ve never quite understood why their nests don’t fall into the water, as the nests appear to be constructed where several shoots of sawgrass grow close together but without any obvious supports between or under them. Somehow the female binds her nest to the unbranched grasses, but I can’t see how she does it. It’s pretty impressive engineering, though. I’ve never found more than one nest in this stand. I think papa blackbird claims the entire end of the pond for his territory. This year, he appears to have two possible choices for his mate. I saw two female blackbirds responding to his calls and checking him out. Perhaps he will have a harem. Blackbirds are at least as aggressive as mockingbirds around their nests. Baby Dog and I might have to change the route of our morning walks for a while. 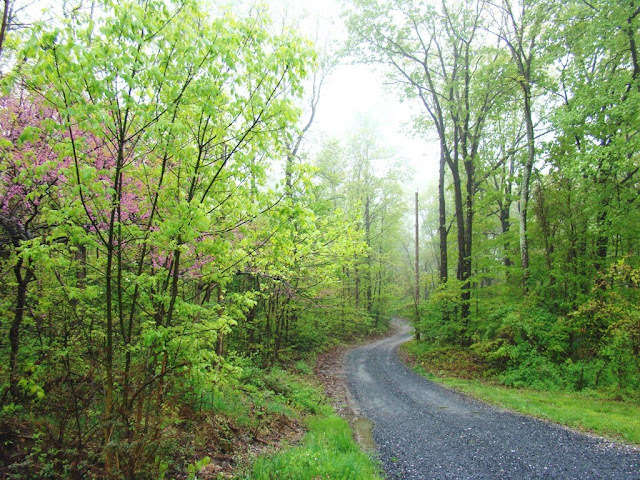 With just four days left in the month, it’s about time for the April showers to finally put in an appearance on Roundtop Mtn. Of course the “May flowers” have mostly already bloomed anyway. This weekend on the mountain saw that misty kind of rain that goes on for days and eventually soaks everything. It’s the good kind of rain for plants and the water table alike. Even for a human like me, who welcomes this rain, the effect of it is a bit less good. The outwear gets soaked quickly and doesn’t dry out before I need to go outside again. The dogs happily track mud into the cabin and create ever more work for me. But after nearly a full month with no rain, I’m not really complaining, just observing. Around the cabin, the early leaves and now happily expanding leafy canopy almost surely mean I will see fewer warblers than is typical and that is always fewer than I’d like. With the canopy much thicker than usual for this time of the year, whatever warblers that don’t overfly my cabin on their flight north will likely be impossible to see. Warblers seem to be fewer in number every year. The years of “warbler waves” that brought hundreds of them in one group are long past. This year I won’t even be able to gauge the extent of the decline as I won’t be able to see the ones that do arrive and fly past. The leafy canopy is welcome in other ways, though. It is nearly always quiet around the cabin, but the leaves of the summer forest make my surroundings even quieter, muffling all but the loudest sounds. I never quite get over the shock of noise when I leave the mountain. Even in nearby rural areas, sounds of cars passing on the two-lane roads seem ever-present to me. Here at the cabin, human sounds are rare and those distant. I like it this way. Most years I don’t have to watch where I put my every step when I’m in the woods. This year the wildflowers are so profuse that I pretty much have to. 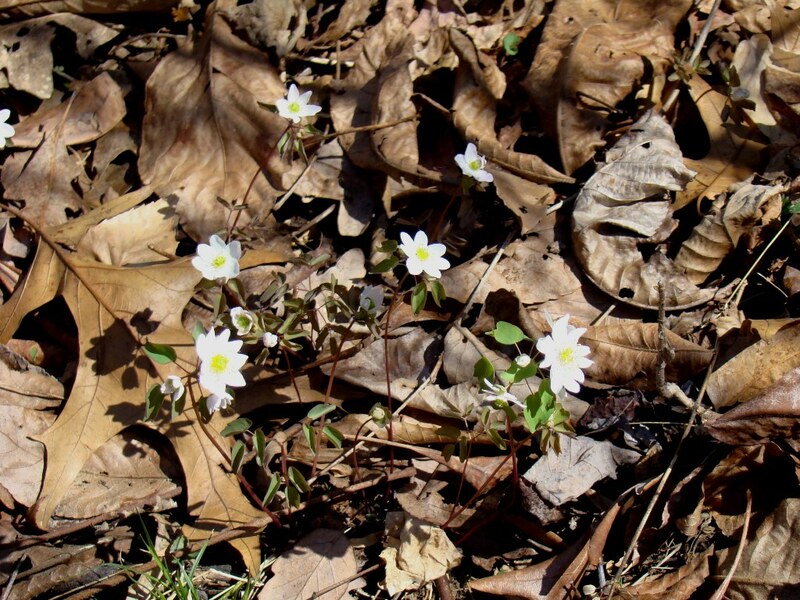 The rue anemone are especially thick this year, which is particularly impressive when you remember that one plant is rarely more than 4-6 inches across. Last evening on my evening walk I came across several patches with 50 or more flowers, all in bloom. Many more patches produced 20+ blooms, and the space between patches was usually only a few feet. Last year the wild geraniums were the showstopper. This year it is the anemone. The geraniums are out, and with more to come, but I’m not finding nearly as many as I did last year. The first mayapples are nearly out, if not yet fully in bloom. It’s interesting to me to pay attention to the variations in wildflowers from year to year. Weather conditions, snow cover, rains, warmer or cooler temperatures—each slight change favors one flower over another in that year. This year had a very snowy winter followed by a very early and warm March (and now a cooler and drier April). The anemone liked that combination. Last year was a nearly snowless winter with a cool spring, and the wild geraniums were thrilled. The enormous biodiversity of the native eastern forest can cope with a wide variety of weather, and responds with subtle variations in its flora just as quickly. That’s part of what makes a forest so interesting to me. A forest is never the same, not from year to year or month to month and sometimes not even from morning to night. Still, a visitor does have to look to see the differences. Skimming your eyes across the trees isn’t going to capture those differences, and it’s these tiny differences, I believe, that make the whole of a forest so precious. I did not intend to or anticipate being away from Roundtop Mountain for as long as I have been. Family considerations took precedence and took me off the mountain for a while. Down in the valley, people are commenting that the sudden and early spring has made the daffodils and the tulips bloom at the same time, the first time in anyone’s memory that has happened. 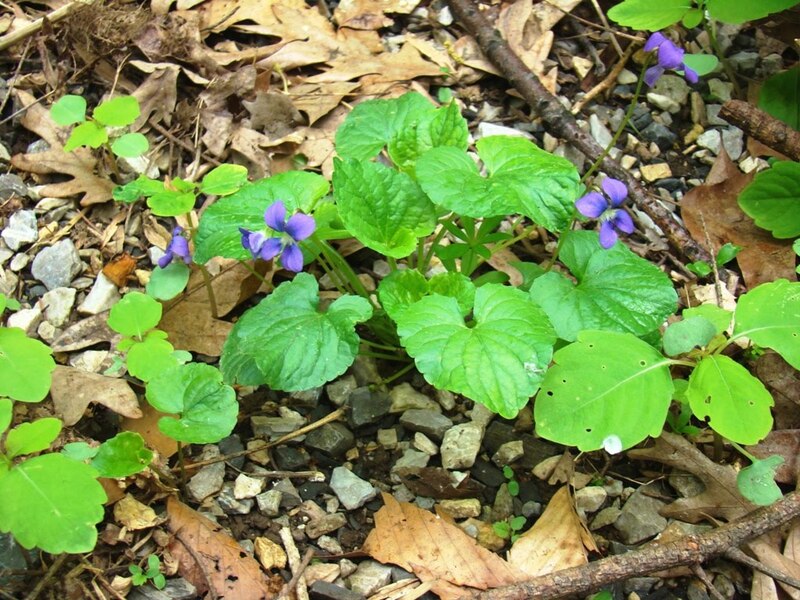 Here on the mountain, it’s much the same, though with violets, wild geraniums, spring beauties and even mayapples all in bloom at once, instead of the tamer daffodils and tulips. The forest is thick with blooms of all kinds. This is both spectacular to see and, I suspect, a harbinger of a long stretch of non-blooming greenery ahead. Woodland flowers tend to be delicate little things, often with just a few days of blooming glory. Once they are gone, they are gone for another 363 days or so. In a normal year, the flowers bloom more sequentially—a week for this one, followed by something else the next week and so on for a while. This year, it’s a big party and everyone arrived at the same time. When the party is over, it will really be over, and I will have nothing to anticipate except six months of greenery. Already, the trees are as leafed out as they are in mid-May. Already, the view to the western mountain has disappeared. Already, the night sky is obscured by a million or more oak leaves. And no, the warblers haven’t arrived yet, but neither have the mosquitoes (may they stay away even longer). This year, the violets seem even more profuse than is typical. They are among my favorites. That deep purple shade is simply unmistakable and a rare color among the more common pale pinks and whites and yellows. I am back on Roundtop Mountain. While I was gone, spring moved ahead without me, as of course it would. Such is the way of the natural world. It always moves on. One year, it will move on without me, but it will still and always move on. Every day is Earth Day. I believe this plant is woody nightshade. That purple shade in the budding flowers isn’t a common color. But I’ve never found the flower before it was fully in bloom or when the plant was this small, so I’m not entirely sure. In any event, the plant looks pretty in the morning sun. Last night the big cold front came through and dropped the temperature a good 30 degrees, so now it feels like spring again instead of midsummer. A few hot days is all it took for leaves to appear on the trees. 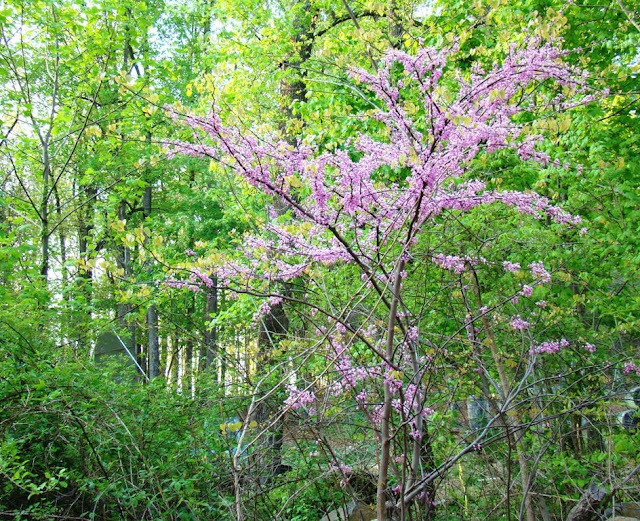 Dogwood and redbud are both starting to bloom now too, and the forest undergrowth is up and leafing out. In the short term, I wonder and worry what this means for this year’s spring warblers. Historically, the migration of individual warbler species was timed to the appearance of specific bugs favored by that species. And those bugs themselves appeared at differing points in the leafing-out process. Over the past 10-15-20 years, warblers simply seem to be fewer in number every year. Those amazing “warbler waves” that I remember as a young birdwatcher are something I haven’t seen in years. It used to be that 20 species of warblers in a day was considered a good day. Lately, it feels more as though I can find 20 species in a season, if I’m lucky, and then only 1 or 2 of each species, instead of dozens. The early springs aren’t the only cause of the warbler decline, of course. The other usual suspects, particularly habitat loss from development, also plays a major role. Perhaps warblers could adjust from one of these causes, but from the two together? Well, so far they aren’t doing very well. So far the only spring warblers I’ve found are the ubiquitous yellow-rumped warblers (butterbutts). It will be another few weeks before I have a better idea how the rest of the species are doing. So what makes the difference? I don’t know the full answer myself. The most obvious difference between here and there is the altitude but the Ductchmen wouldn’t mind that little change. 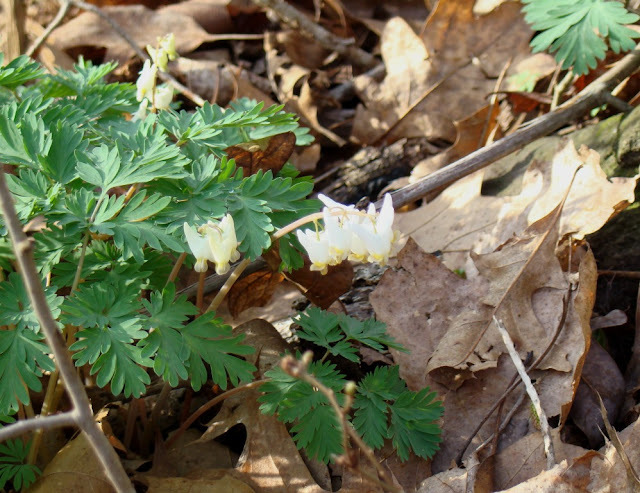 Like the bloodroot, of which I have many, Dutchman’s Breeches are spread by ants (ditto). 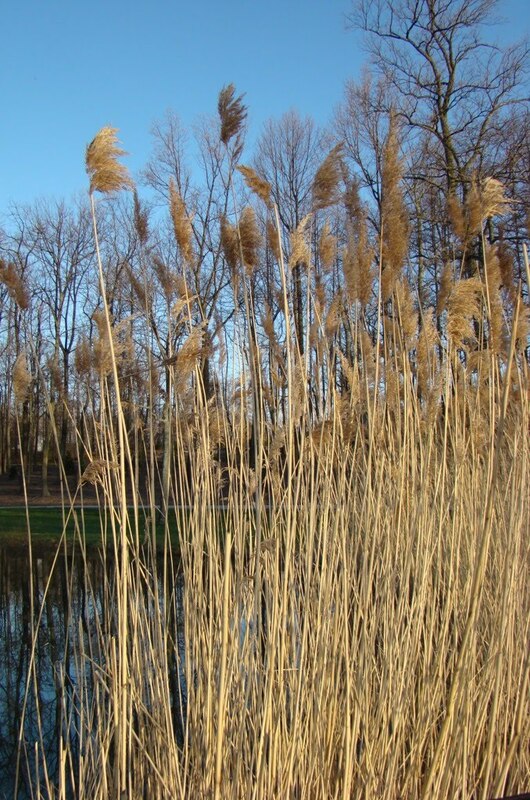 The plant favors rich, moist woods. Here, up where I live, the forest is probably too dry for them. But I’ve also never found them down in the valley between Roundtop and Nell’s Hill either, and to my eye, the soil down there is plenty rich and moist enough. And there’s ants down there, too. Something apparently isn’t suitable here for the plant, and those three miles in distance make all the difference. Forests are like that. No two spots are alike, no matter how near they are to each other and no matter if the basic forest structure (in this area an oak and hickory forest) is similar. Having seen one oak and hickory forest, or even knowing one well, doesn’t mean I know them all. Visiting a different forest, especially so close to my own simply underscores how unique each spot is and makes them all seem more precious to me. Spring beauties are early too! I am starting to sound like a broken record. The spring beauties are blooming in the forest today, and like everything else this year, they are early by a good ten days. In 2009 and 2007, their bloom date was April 17. In 2008 it was April 15, and in 2010 I first saw two flowers on April 4, followed by many more by April 6. Yesterday the temperature broke a record for the day by 4 degrees, a huge number. It feels as though I am in heat wave territory. Records will likely fall today, too, before relief arrives on Thursday when the temperature will drop some 30 degrees. Of course, that relief will come with thunder and lightning and possibly other severe weather. Ninety degree weather is not something I am prepared for in early April. It was only last week that I put away my midwinter sweaters and replaced them with long-sleeved cotton tops and cotton sweaters. This week I need short-sleeved midsummer wear and linen trousers, but I’m not about the iron the winter wrinkles out of anything in this heat. The windows are open, and the dogs loll on the deck. Easter flowers wither by evening even when watered in the morning. I fear it’s going to be a long, hot summer, with an emphasis on the long. The one-day wonders are way early this year. I just checked my records for the three previous years and found that bloodroot flowers bloomed on April 25 in ’07, April 21 in ’08 and April 20 in ’09. So ’10 comes along and blows those dates away with a blooming date of April 5! I should probably warn my readers that this week is shaping up to be “flower week” at Roundtop Ruminations. Unless I get a great fallout of migrating birds at the cabin this week, you’ll be seeing and hearing about the woodland flowers most of this week. Bloodroot is such a pretty flower that I wish it lasted longer than a day or 1.5 days. I have about 20 blooms at the edge of my driveway this and every year. I have to be careful when I bring the car in not to go just a few inches wide and damage them. That’s how close they are. Bloodroot is a native flower, spread by ants, which probably tells you something else about where I live. The sap is reddish, hence the name. Apparently, when make into a paste, it destroys skin tissue, so it’s not a particularly safe or useful plant, except for its beauty. Although it’s not something you can easily see from photos, bloodroot flowers are quite a bit larger than the more typical wood flowers. 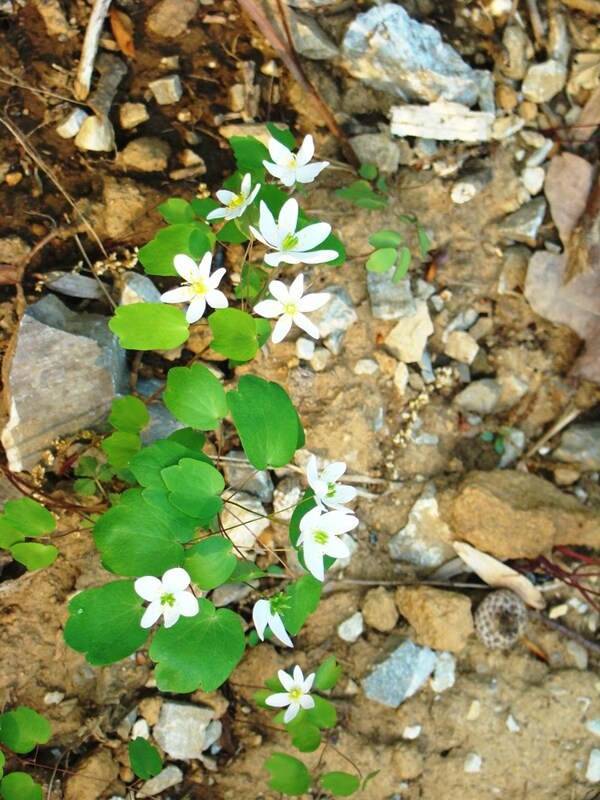 Many of the spring lovelies are tiny in the extreme, with flowers half an inch or smaller. Bloodroot flowers are about 2 inches across and very showy. The petals look somewhat waxy but don’t feel that way. I'm still getting used to the fact that these flowers are blooming two weeks earlier than usual. That's a lot--a big "lot." I'm going to mull that one over for a while. The first of the new spring wildflowers are out! Coltsfoot is up and blooming here on Roundtop Mountain. The only other blooms I found this weekend were two tiny spring beauties. 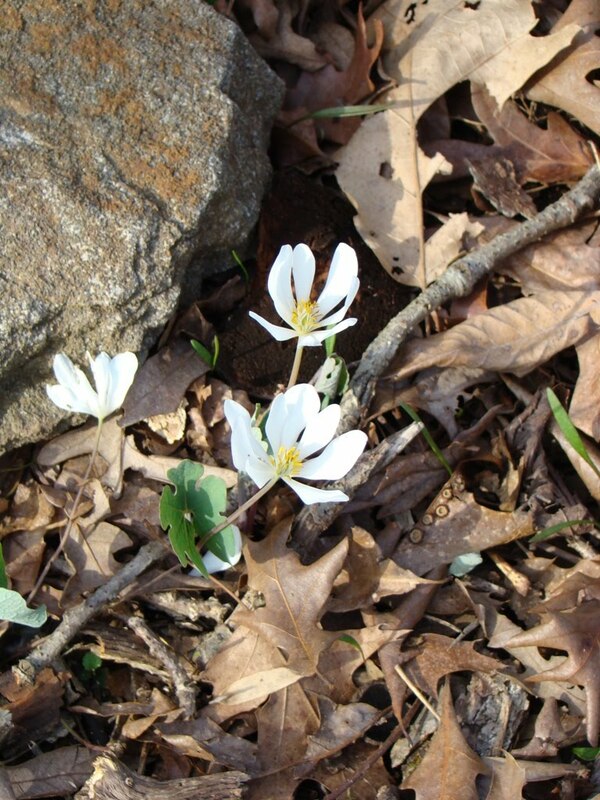 Bloodroot is almost blooming and likely will appear today for the first of its one- or two-day annual extravaganza. But yesterday was the day for the coltsfoot to appear, urged by the warm temperatures and the sun. Winter ended abruptly this year, replaced by a warm March. And though it feels to me as though it has been warm enough for long enough that the early blooms should have appeared before this, the reality is that they are blooming pretty much on time. In 2008 the first coltsfoot appeared on April 6 and in 2007 it was April 17, but that year a late cold snap likely affected them. In 2009 I didn’t record the date, but the blooms typically arrive the first week of April. 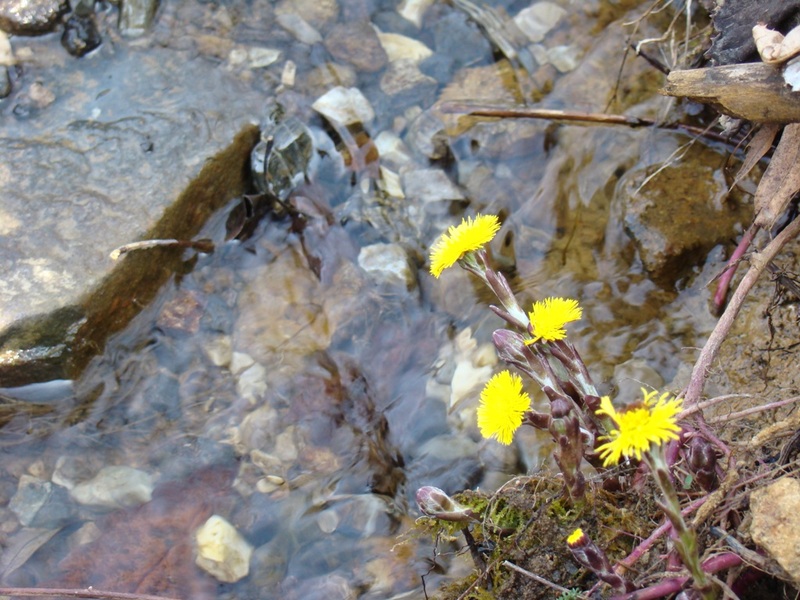 Coltsfoot is the earliest of the blooms I see here on the mountain. For years, I thought they were dandelions and didn’t pay much attention to them. Eventually I realized they had no dandelion leaves and that’s when I found out that are not dandelions at all. Coltsfoot isn’t native to this hemisphere, being among the huge number of plants brought over from Europe for their medicinal purposes. On Saturday morning I left the mountain, dropped down about 650 feet in altitude and went to Pinchot State Park where I saw many more blooms. My best guess is that 650 feet in altitude equates to about a week’s difference between what I see on the mountain and what is happening down in the valley. 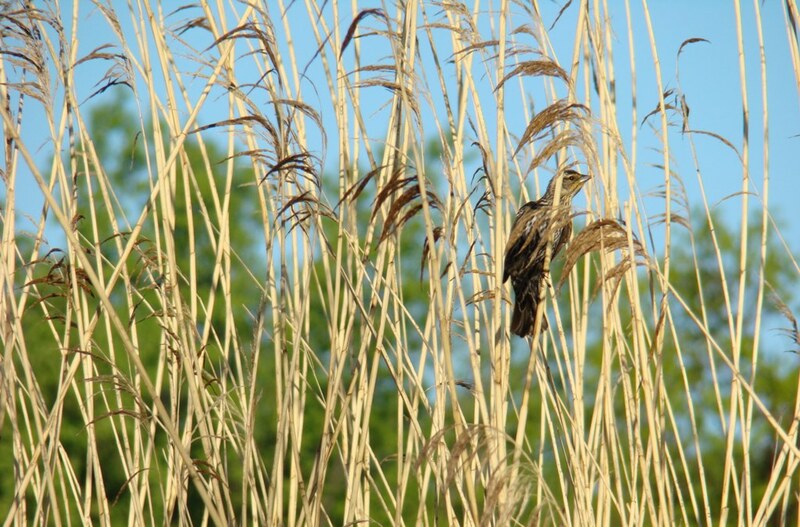 The good weather prompted large numbers of birds to fly north, starting on Friday. New arrivals on the mountain are eastern towhees, brown-headed cowbirds and chipping sparrows. Expect to see a lot of wildflower photos here at Roundtop Ruminations this week. Flowers are much better at sitting still than the birds! Looking towards the future or examining the past gets in the way of too many of my present moments. Here on the mountain, where I am surrounded by beauty, I am often jolted out of my plans and reflections by some stunning moment of light or beauty or simply by nature’s complexity. I wish I didn’t need the jolt so often, though I’m glad I at least wake up when I get the jolt. Living without ever getting jolted by these amazing moments would be nightmarish. For me, part of the difficulty of remaining in the moment has to do with forecasts. When a big storm is moving across the county, I know about it days before it arrives. When radar shows a huge migration lift-off up the east coast of the U.S., as it did last evening, I know the spring songbirds are coming. It’s difficult for me to stay in the moment when I know I’m about to get 2 feet or snow or when I know the raptors and songbirds will arrive tonight or tomorrow. I’m not saying forecasts are a bad thing or that I wouldn’t want to know the storm is about to arrive. I’m just saying that forecasts feed into spending time planning for the future to the detriment of enjoying and appreciating the present moment. I can’t say that I know how to reconcile the very real benefit of a forecast with staying in and enjoying the present moment. I guess I’ll have to work on that. Some days I don't seem to be making a lot of progress. But just so you know—the spring songbirds are on their way. After what feels like forever, the sun is out this morning and the temperature is climbing toward warm. The dogs are bouncy and full of energy, the chickens are trying to forage further afield and the raccoons are busier than ever. Everywhere I turn, everyone and everything showed more energy in the last 24 hours than I saw all winter long. I’m starting to see signs of growth on the forest floor—the bloodroot is just tipping above ground, but most everything else is just an undecipherable leaf or two. I study the tiny leaves hoping I can figure out what they may turn out to be, but I usually give up. It’s too soon, if tantalizing. I’ve also reached the point in the season where I need to clear up around the cabin. “Things” that made for interesting bumps in the snow now show themselves for the junk they really are. The stone walkway I’ve been very slowly building needs cleaned up and readied for more work. The juniper bush that I’ve let grow into a natural state is threatening to take over my driveway and certainly needs trimmed back. The unending war against multiflora rose needs to be engaged yet again. I know this war is unwinnable but the battle needs fought, and besides, I want to walk through my back forest without leather chaps. Perhaps this year. Isn’t it amazing, what a little bit of sunshine can do?